Psalm 92 is undoubtedly among the more famous chapters of Tehillim, as it is recited each week as part of the Shabbat service. 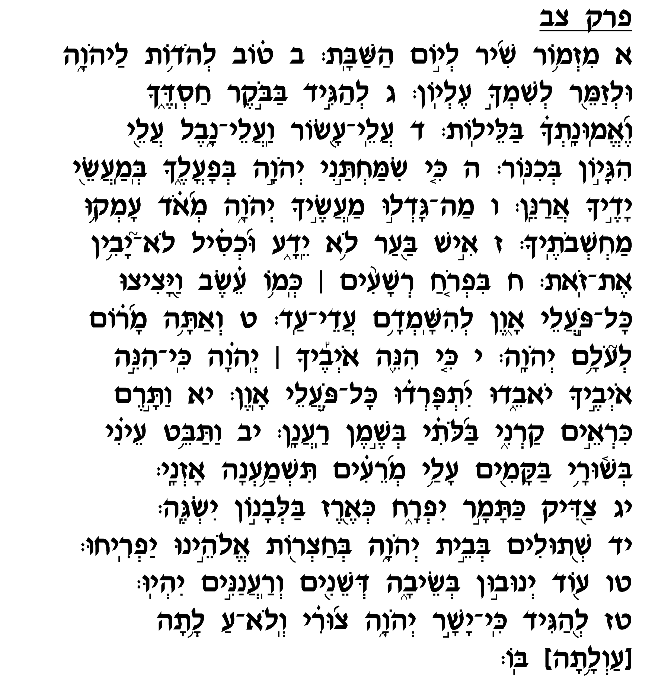 Indeed, the chapter's opening verse informs us that it was composed specifically to be read on Shabbat. Although the Psalm makes no direct mention of Shabbat, it is nevertheless very relevant to the theme of Shabbat, as Rashi explains, in that it foresees the time when the world will achieve perfection, and each day will, in a sense, bear the idyllic quality of Shabbat. A more careful analysis of this chapter reveals more clearly its relevance to Shabbat. Its author – who is commonly identified as Moshe Rabbenu himself – focuses on how befitting it is to give praise to the Almighty despite the misleading phenomenon of wicked people who succeed and prosper. Only the fools, Moshe declares, allow themselves to be misled by the success and power of the wicked (verse 7). The simpleminded fail to realize that ultimately evildoers will be destroyed, and the righteous men of the world will assume their rightful stature of honor and glory. The ultimate defeat of evil and glorification of the righteous will demonstrate "Ki Yashar Hashem" – God's impeccable and undeniable justice (verse 16). On that day it will be clearly recognizable to one and all that evil is not tolerated while piety never goes unrewarded – even if in the current state of the world the wicked generally prosper and the righteous often suffer. Shabbat is the day when we anticipate a more perfect world, when we withdraw from the worries and concerns that occupy us during the week, and find comfort and solace in the belief that the world will one day be perfected. Appropriately, we recite this Psalm which reaffirms this basic belief and reinforces our conviction that righteousness will one day emerge triumphant over evil, that the world will ultimately see the demise of the wicked and the blossoming of the devoted servants of God.